Today’s scripture reading is taken from Hosea 6:1-3. The theme for this year is “Press on to Know the Lord”. Knowing the Lord is kind of difficult. Knowing mathematics, knowing about cars or knowing about what’s going on in my life, those are easier to know but, knowing God is very difficult because it’s not tangible. Especially in modern society, we’re filled with a technological and scientific mindset, so with that mindset it is very difficult to know the Lord. 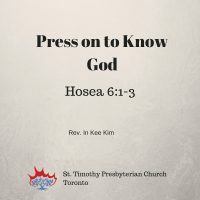 The prophet Hosea said, “let us press on to know the Lord and then he will come forth surely”, so he seems to have some kind of confidence about knowing God and understanding God. In modern days, that doesn’t seem right. We don’t speak surely about the things that we cannot touch and see, so it is harder to know God. The person who knew Jesus Christ most intimately and deeply was St. Paul. This is our theme for this year but for Paul, this was his life theme. Everyone has a life theme. Some people think I want to be successful, or I want to write books, or I want to be good at this or that. They have their own life theme. St. Paul’s life theme was press on to know the Lord. He said that knowing Christ is the most valuable thing. Compared to that, everything else is lost, rubbish. Knowing God to St. Paul was a lifetime goal. I think knowing God is difficult so it has to be a lifetime goal. We just started this year, that doesn’t mean that we’re going to finish pressing on to know the Lord, we’re going to continue. Last year was a “Journey to Fullness” and that doesn’t just end in 2015, we continue, so these themes, we’re just beginning to start it. Through St. Paul actually, we have learned a lot of good wisdom about Christ. Without St. Paul, Christianity was not possible. Jesus Christ gave the message, but it was St. Paul who started Christianity, some people say, and that is so true. It was St. Paul’s understanding of Christ. Based on that, we built Christianity, and more than half of the New Testament was written by St. Paul. But he never met Christ. He never saw Christ, but he knew Christ so intimately and deeply. How is this possible? That’s what I wonder, that’s a mystery. He never met Christ, but he knew Christ best. Knowing God and knowing Christ is not really an academic exercise. Knowing God is very much your lifetime experience. When you read St. Paul’s letters, as he knew God, he extracted insight about life, insight about people, insight about himself. As you know God, you can extract those insights about life, about yourself, and about people. You don’t go into the heavenly realm and then know God. God is very much in touch with our own reality. As you know God you understand life a little better. St. Paul set that as his life theme. Why? Because he saw some wisdom in your effort to know God. As you strive to know God, that striving itself gives you access to certain things in life that you will never get without it. As you strive to know God, you may not fully know God, but that itself will open up your life in some way. For example, I know guitar, but that knowledge doesn’t change me at all. I just know guitar. I know this, I know that, that’s worldly knowledge, but when I say I know God, that changes me. The moment you know God, you change. So if you want to change, don’t try to change yourself. Try to know God, and God will change you. Sometimes when we try to make changes in our lives, we are forcing it, and then sometimes it doesn’t work very well. But as you get to know God, somehow things fall into place and then your life turns out alright. Even in that effort to know God. Every day you think about wanting to know God, and that itself will change us and make us become a person that we never imagined before. You become happier, you become freer, you become more confident, you become strong. It’s not raw strength, but very gentle strength, you gain confidence. When you try to build your life on your own, on your own morality, on your own righteousness, sometimes you become harsh, you become very narrow minded, you build false religiosity. Sometimes you become very judgmental. All kinds of negative things are built up, but as you strive to know God, you change. The person changes and people say, wow, you’re different. Why are you so happy? Why are you so confident? Because, as you strive to know God, you change. This is what happens. You strive to know God, and then you change. Because you change, the next time, you know God more deeply, and knowing God more deeply also changes more on a deeper level. After that, with that change, you can understand God much better, and more deeply. That is the spiritual cycle. That is the wisdom of life. Psalm 1 is not just an orientation of Psalm, but Psalm 1 is an orientation of life. In Psalm 1, the writer said, blessed is the man or woman who meditates on the words of God. Meditate on knowing God. Blessed is the person who presses on to know God. Their life will be like a tree planted by streams of water, and in every season, they will bear fruit. These people understand the wisdom of life. You strive to know God and you become like a tree planted by streams of water and your life becomes fruitful, abundant. Of course knowing God is not like reading a manual and understanding how to operate, but as you strive to know the Lord, asking things like “I want to know you. Who are you? I cannot see you, but who are you? I want to know you. I want to know how you’re working in my life.” As you strive towards that, change slowly starts to happen within you. You become a happier person. Otherwise, life is depressing. It can be quite gloomy. Sometimes you feel that you have lots of worries and anxieties and fear and these things attack you. You don’t know what to do. But as you strive to know God, deep inside, you will have the strength to fight off these negative thoughts, dark forces, and gloomy thoughts. In that way, you become a much more fruitful person. In your job, in your relationship with others, in your church work, in your faith. I believe that doing God will help us tremendously. But we cannot take a casual attitude to knowing God. Once a week you come to church and you listen to the sermon, that’s now how you get to know God. Knowing something is very, very difficult. I love photography, I tried to learn about a camera. That itself takes so much time so I cannot do much, but just knowing something is very difficult to do. Knowing God is much, much more difficult to do. You cannot just casually take this attitude you have to press on. you have to give your full effort to a know God. Either come to bible study or study on your own, meditate about how God works in your life, and you’ll get to understand about God little by little and about your life little by little. It is a holy effort that we have. Jesus said ask, search, and knock. These are all pressing on. Ask, search, and knock. He said ask, and it will be given to you. Search and you’ll find. Knock, and the door will be opened for you. Prayer is knocking at the impossibility. Praying people are strong. When they face impossibility they don’t give up. They knock at the impossibility. That’s what praying people do. I shared that on December 31st. Praying people never give up. When they see impossibility, they face it and challenge it and they knock it. In your life, you’ll find some impossibility, seemingly impossible situations in your life. Don’t give up. Press on. Knock at the impossibility and you’ll be able to overcome it. God will reveal himself to you. When you search for God, God will reveal himself to you. When you’re too proud, God will hide himself. God becomes hidden. A lot of old saints experience the absence of God, and then when they experience the absence of God, they become humble and broken again, so they search again and then slowly God appears, and then they experience God. In your life, I hope that God becomes a little bit more real this year. I hope that God does not become just a theory. I hope that God becomes real. Ask. Search. Knock. See whether God becomes real in your life. We should always have a humble attitude, then we’ll be able to see God little by little, and your life will change little by little.